Is there a way to program a propeller's EEPROM with a simple "Select file and click" program instead of the Propeller tool? I just distributed a product today and realized at the last minute that there is something in it that should be corrected, but the person operating the device is not a programmer and will not want to download the Propeller Tool software. Is there a simple program that will let you select a file (In windows explorer) and download it to the Propellers EEPROM? Follow me on Twitter! Search "Microcontrolled"
The easiest way is to use Propellant.exe. You can write a small batch file to load your binary. You would have to sent your file and Propellant in a zip. Thanks, but this person that will need to download this will not know how to operate a command line driven program nor will he want to learn just to download this update. Is there something more along the lines of a GUI Windows app available? If you write it as a .bat file, they should be able to double click on it and it will process. They will need to load the FTDI drivers though. To the FTDI drivers, I've loaded that already, and I have a PC app I wrote to take output from the Propeller and manipulate the device, so it is already USB equipped. I'll google "Batch file" right now and figure out how to write one. I must ask, if I am just going to Email it, where should I have the directory land? 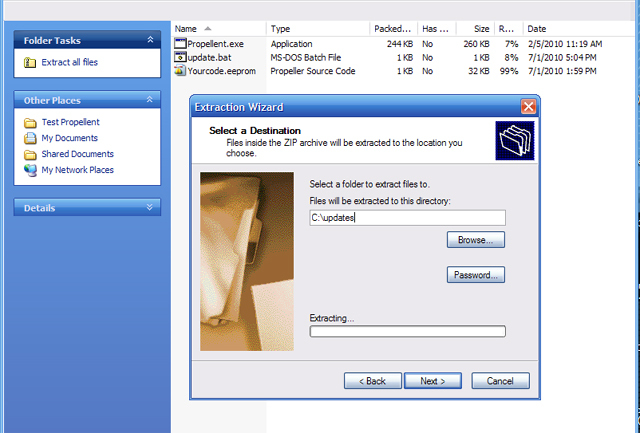 In the batch file, you can·navigate to·target directories,·like·"cd\mydirectory". I'll try and put something together for you, but I·will be out for the next 2 hours. OK, is is possible to control Propellent in Visual Basic 2008? I could write a nice app for this. I have a custom GUI based on RealBasic, you can send them the app with a folder that contains bstl, your update, the required PC or OSX files. 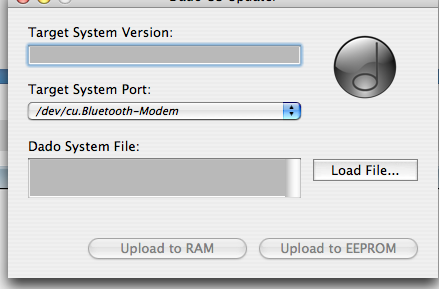 They can update RAM or EEPROM. Select the file, then run it. PM if you want to check it out. It does have my logo on the icon and app, but you could mod the realbasic version to replace it with your own logo if desired. It has some nice features, like checking your website for newer app version. You would need to send them the FTDI driver for their platform. Simple upgrade. You create a zip file containing Propellent.exe, your .eeprom file and your batch file. I think there are several solutions to "Is there a way to program a propeller's EEPROM with a simple "Select file and click" program instead of the Propeller tool?" and it runs that binary. Or post them a new sd card. (to paraphrase an old saying, never underestimate the bandwidth of a van full of micro sd cards hurtling down the highway). If you posted an sd card, this is a solution that never needs a PC. Just pop in the new card and run the new program. So it becomes very simple for an end user who never needs to worry about downloading the propeller tool or recompiling a program. You can add autorun as well if you like, so if the user doesn't type anything on a keyboard for a while, it just runs a default program. I'm using this as a way of organising all the retro emulations. You don't need external memory to run KyeDOS. Just a standard propeller chip with eeprom, keyboard, display and 4 lines for an sd card. However, it does NOT have an SD card, otherwise I would have a soulution already. I made a batch file and sent it, with instructions to put the folder under the C: directory in no other folders. I could have made an installer for it, though. Thanks for the help! That is a great effort! The package should also include the propellent.dll. Some FTDI driver instructions might be helpful too. FTDI drivers would be good also. Micro stated that the customer already had them installed. I'm not sure how many people would need the .dll in this instance, but it's small enought to include it. Did you end up using Propellent? is it possible to control Propellent in Visual Basic 2008? Hi , I posted a doc with an outline of some testing I did using Visual Basic 2008 and the Propellent.dll at this link http://forums.parallax.com/showthread.php?p=911205. I believe it would be a nice solution for your particular needs·. The batch file·is certainly a good option too especially if you want to cut down on·software and installation. Jeff, How soon this stuff gets buried in the forum! That was only a coulple of weeks ago and would have been good input to the OP. Absolutely true hover1 , this forum is amazingly active ,· if·I don't bookmark an item of interest I know I'm going to regret it later. So I have lots of bookmarks. My experience has been that if the propellent.dll is not installed, propellent.exe will not work. Your post alarmed me a bit, because I'm using propellent.exe as a loader for the S2. So I did a search for all copies of propellent.dll on my computer and either renamed or deleted all of them. I can happily report that propellent.exe still works without them. Version 1.2 seems to work fine without the .dll . I see they allow control of that silly little GUI now. I ended up using the batch file and Propellent for the update. I just got word that it worked, and was fairly easy to use. Thanks for all the help!